Monostich (Grade: A+) One of the funniest books ever written. Adams had a special kind of inspired lunacy that has never been matched. 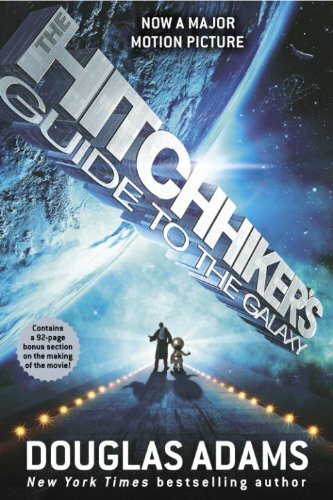 nedsu (Grade: A+) Though not a book you will read for the plot, I think The Hitchhiker's guide is an incredible book. It is rare for a book to cause me so many laugh out loud moments and even rarer for a book to be readable purely because of the style of writing. The plot is hardly memorable, but you will remember lines and paragraphs that made you laugh. SquidProQuo (Grade: B+) If ever there was a book you should have read in Junior High School, this is it. One of the best books for reading while you are young, then having it to regurgitate at random points into your head for the rest of your life. You don't read this book for the 'story' as much as for the ridiculous turn of phrase that the author was so good at. And it will stick with you forever. notapuppy (Grade: B+) Adams is hilarious. BeardedHeckler (Grade: D+) I think I liked "Hitchhiker" less than I might have because it was SO built up for me in my mind, I expected it to be awesome. I expected to spend the entirety of the book in side-splitting fits of laughter, and it just didn't work out that way. I smirked a fair few times, chuckled at least three times, and laughed out loud once. Problem is that it's nothing but humor, no substance, and if you don't laugh, well... yeah.